During spring, summer and autumn, Oberammergau’s colorful façades are enhanced by overflowing boxes of trailing flowers. And during the most grey of winter months, I find that the Lüftlmalerei inject a much-needed cheerful ambience to this chilly Alpine village. The painting style grew in popularity in the 1700s in southern Germany and in Italy, as it was a way for residents to flaunt their success and wealth. These are all lovely, Tricia, making it hard to guess. Nice way for fresco artists to display their talents. Lynne, I was just being playful by putting that challenge at the end – of course there’s no way for you to know. :) Theirs is the center window on the bottom row. Beautiful art work! I didn’t realize that your parents lived in Germany. Are they German? The art work is pretty impressive, isn’t it? My parents are already debating how they’ll find an artist to touch up their house’s Lüftlmalerei in the next few years. Jo, whimsical details like these certainly make it fun to explore this part of Bavaria. Funny, though we did get snow recently, this won’t be our ‘winter home’ this year. We’re leaving Germany in December (to an undecided location) so we’ll have to enjoy the memories of last year’s snow. :) I do hope we’ll get to one or two Christmas markets before we leave. What a marvelous collection of windos! Very nicely done! Many thanks, Phil! They represent a variety of buildings – everything from a mom & pop shoe store, to inns, private homes, restaurants and a forest management building. Such a beautiful place! I love all the painting. I blogged about this place just recently too…. Hopefully this is the link if I did it right! Donna, glad you’ve been enjoying your grand tour of Bavaria! Thank you for sharing your tales from the region. Hi Trish, this is a pretty cool collage that you made and those frescoes are amazing and fun to watch….are you still in Germany? These are so pretty, and neat, and clean. I feel like I’m looking at windows you might find on a dollhouse! Juliann, it’s funny you mention them being dollhouse-like, because last year, one of the homes in the village decorated their window interiors with vintage dollhouse furniture and scenes. It was quite charming. What talent the artists have for being able to so expertly paint these beautiful scenes and swirls! “Magical” is the perfect way to describe the Christmas season in Germany, Ruth. We were lucky enough to be here in Oberammergau last winter, and took in a few holiday markets. When I was in Heidelberg, I lived just a few meters from all the Christmas Market stands, so warming up with Glühwein was a regular event. :) Just your mention of Christmas markets makes me hungry for Potato Pancakes with Apple Sauce (Kartoffelpuffer mit Apfelmus). Do you have any favorite fest foods? The Lebkuchen and other Christmas goodies hit the grocery store shelves about two weeks ago. We’d always talked about visiting the Lebkuchen factories near Nürnberg when my parents lived not far from there, but didn’t make it. It’d be fun to see the behind-the-scenes of how it’s made. What do you usually pair Stollen with? Like you, I don’t think I was much of a fan as a child, and I’m wondering if I’d like it now (if I could find a gluten-free version). I love these windows with the Lüftlmalerei. I wanted to guess the middle picture of the third row was your parents’ window. Somehow I thought your parents would have green shutters. I’m not sure why i thought that. Thanks for sharing these awesome pictures. Darlene, I’m not sure how your message got buried in the Spam folder, but I wanted to send belated thanks for your warm feedback. :) It’s funny that you – and coincidentally several others – guessed which window / Lüftlmalerei decoration is from my parents’ house. I’m curious how long the average Lüftlmalerei decoration lasts before another artist needs to touch it up or re-do it? I think their home was last touched up in the ’80s, but some of them in town have a really special patina. The town must be absolutely enchanting – when it isn’t filled with visitors – is the miracle play still every ten years? very nice. hope you will check out my similar post on balconies of Lima, Peru. Tricia, lovely images of the Lueftlmalerei, I guessed that the middle image in the center row is your parents window, because the windows are open, so thought you might have opened them. Servus, Cornelia, und danke schön! Did your childhood home also have Lüftlmalerei? My parents are lucky to have been given some vintage photographs of their home, and it was interesting to see how the Lüftlmalerei was painted differently through the decades. We think their home is from the mid to late 1800s, but we’re not certain. Guten Morgen Tricia, the home I grew up in Munich my father had buit it himself in 1957, no Lueftlmalerei. Your parents are so lucky to live in such a house, like what they would call her in the US a landmark house, but I am sure it requires a lot of maintenance.Did you get dusts of snow yet, I bet it’s cold by now. If I had wings I would fly over to Garmisch to my family and meet you. Cornelia, landmark homes certainly are a labor of love! Surprisingly, we had quite a snowfall about 2 weeks ago. I’m not certain how much, but it was a heavy snow when it came to shoveling. In the weeks since that early delivery of snow, we’ve had pretty spectacular weather – mid 60s, sunshine and beautiful autumn colors. (I know this isn’t unusual for Californians. :) I think that weather trend is set to change later this week, though, with freezing temps projected. I do hope that someday soon our paths will cross, Cornelia – on either side of the Atlantic. 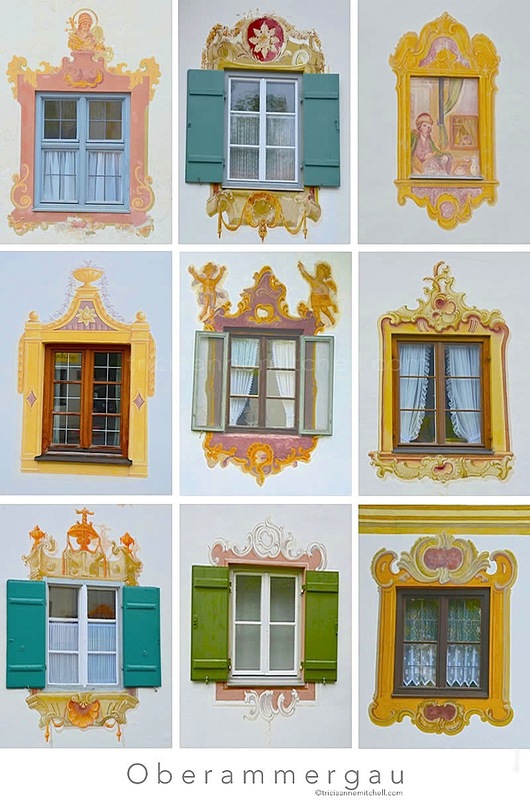 We were fascinated by all the painted buildings in Bavaria. They are all so pretty and we would often walk around just looking at each one and taking more and more photos. How lovely. I love the way these architectural features make places distinctive in a world where so much conforms to a bland norm. I remember years ago being fascinated by the doors in Amsterdam and taking lots of photographs of them. One of those posts filled with photos that I just had to share…. Sylvia, I wish I could come close to creating such beauty! Since I’m not a painter, it was fun ‘collecting’ some of my favorite windows here. :) Have you been to Germany?